I went on another long walk that I will describe in a future post or two, but I had a great encounter that I’d like to mention now before it’s too late. At around 12:30pm I was heading south along the Pacific Highway through Wahroonga, a suburb on Sydney’s Upper North Shore. As I headed along a narrow footpath, I saw coming towards me what at first I thought were a pair of council workmen, with the one in the lead pushing what I thought was a cart of landscaping tools. As we drew close I stepped aside to let them pass, and as they thanked me I noticed a very familiar question on their front of their cart: R U OK? And above that, the words ‘Walk For Life’. I excused myself and asked about the R U OK? reference – and their answer astounded me. To raise awareness for R U OK? 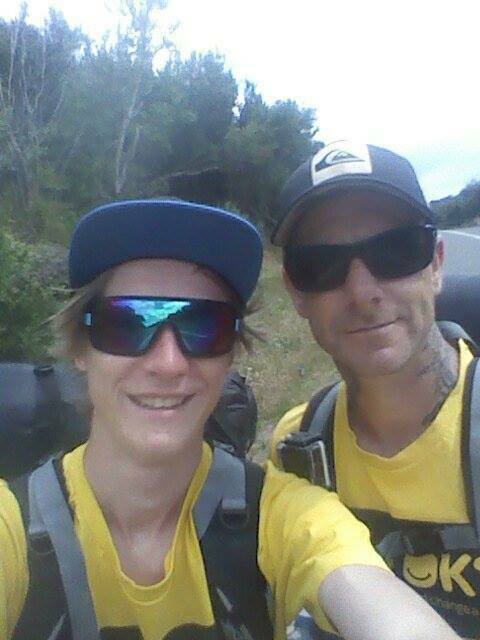 they are walking from the Mornington Peninsula down in Victoria up to the Gold Coast in Queensland. That’s a distance of about 1930 kilometres (almost 1200 miles). And they are planning to do it in 40 days. I decided not to hold them up much longer, so I made a donation and wished them all the very best indeed. Hours later after my walk was complete, I looked them up online. You can learn about, support and follow the progress of father-and-son team Jay and Luke Hawkins at their fundraising site and their Facebook page. This entry was posted in Inspiration, Life Challenges. Bookmark the permalink.